“We wanted to create a place of peace so that peace will flow out to the people” said Sister Suzanne Brauer, OP, when asked about why the Peace Center in New Orleans was developed. 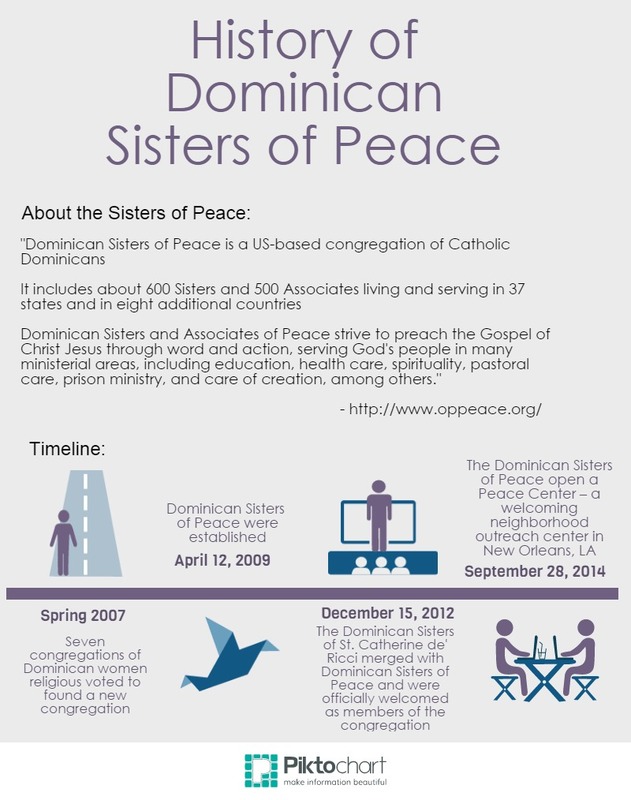 The Dominican Sisters of Peace opened the Center in New Orleans on September 28, 2014 as a neighborhood outreach organization for people of all ages. The former grocery store, located at 2837 Broadway St, has been fully renovated. It now includes a large gathering space that also functions as a computer lab, offices for counseling and spiritual direction, and two apartments on the second level that serve as the homes for the three nuns who run the Center. The nuns, Sister Suzanne, Sister Patricia Thomas, OP, and Sister Ceal Warner, OP, hope that the Peace Center will serve the community as a place to gather, learn, and seek comfort. “We know so many people’s lives are troubled in so many ways. We certainly aren’t the answer to all of it but, you know, if they know somebody cares and somebody’s willing to listen maybe even make some connections for them that would be really great. So we’re not the saviors, we’re the companions,” said Sister Suzanne. Some of the activities that are offered at the center include computer training, tutoring for children, counseling, and bible study. The sisters also hope that the center will provide opportunities to people who may not typically have them. “I think change happens one person at a time and we just need to get them in one at a time” Sister Ceal said. Each of the Sisters had their own reasons for deciding to live above and run the center. “After talking to people about what they could be doing and how they could be making a difference, I realized the time had come for me to act on the same things. Talking the talk is one thing, but it was time to walk the walk” Sister Patricia said.